I read this 1976 book again. The old Dallas Seminary of those days was so good at dispensationalism and eschatology. Here Walvoord (President of Dallas at the time) critiques the 1973 postribulationalist book by Robert Gundry, The Church and the Tribulation. 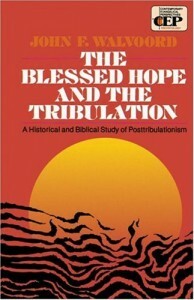 Gundry had become popular as a premillennialist and mostly a dispensationalist. So his postribulationalism was an odd thing for someone from that point of view. No one answers Gundry like Walvoord did in those days. Walvoord found that the predominant characteristic of postribulationalism is that it must begin to spiritualize passages that ought to be taken literally, and also that it cannot account for the supposed removal of all the saved at the end of the tribulation. Walvoord also gives a good review of the history of postribulationalism and its various points of view. One thing is for sure, postribulationalists have never had total agreement on all the aspects of eschatology among themselves. They cannot say, “all postribulationalists agree that . . .” Most postribulationalists throughout history were amillennial and placed (whether literally or spiritually) all of the tribulational activity just before the final appearance of Christ at the very end of human history. These kinds of books are always worth reading again.